Food and Fuel America.com: Ethanol Made From Watermelons? It's Not a Fruity Idea! Ethanol Made From Watermelons? It's Not a Fruity Idea! The summertime favorite may play an important role in helping to break America's dependence upon foreign oil. 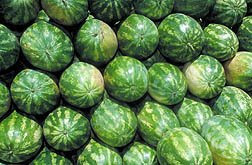 According to a new report by the Agricultural Research Service (ARS) studies in Lane, Okla., watermleons show potential for producing ethanol from melons often left in the field due to external blemishes or deformities. Now, instead of being plowed under, such melons could get an economic "new lease on life" as ethanol. Normally, this biofuel is produced from cane crops like corn, sorghum or sugarcane as a cleaner-burning alternative to gasoline. The watermelon work reflects a national push by ARS to diversify America's "portfolio" of biofuel crops that can diminish the reliance on petroleum, especially from foreign suppliers. Chemist Wayne Fish's ethanol studies at the ARS South Central Agricultural Research Laboratory in Lane complement ongoing research there to commercially extract lycopene and citrulline from the crop. Both are valued nutraceutical compounds thought to promote cardiovascular and other health benefits. In publication-pending studies, Fish showed ethanol can be fermented from the glucose, fructose and sucrose in waste-stream juices--what's left after lycopene and citrulline are extracted. Making ethanol offers the potential benefits of helping to defray sewage treatment costs associated with nutraceutical extraction, and providing watermelon growers with a new market for their crop. On average, a 20-pound watermelon will yield about 1.4 pounds of sugar from the flesh and rind, from which about seven-tenths of a pound of ethanol can be derived. To extract all the possible sugars, Fish is seeking to degrade the rind with chemical and enzyme treatments. He's also evaluating different combination of temperatures, yeasts, antifoaming agents and pH levels to optimize the system. Researchers continue to look at other sources for ethanol as well. Which is why efforts to kill off early ethanol efforts is really a plot to stay dependent to foreign oil. So enjoy the summer treat. It might be the key to a cleaner, safer domestic fuel source!